Aerobic treatment-ATU-drip irrigation systems TREAT the wastewater prior to disposal. There are two types of aerobic treatment systems: extended aeration and fixed-film. The treatment units that we utilize in our designs produce effluent that is virtually odorless and colorless (depending on the treatment unit product). 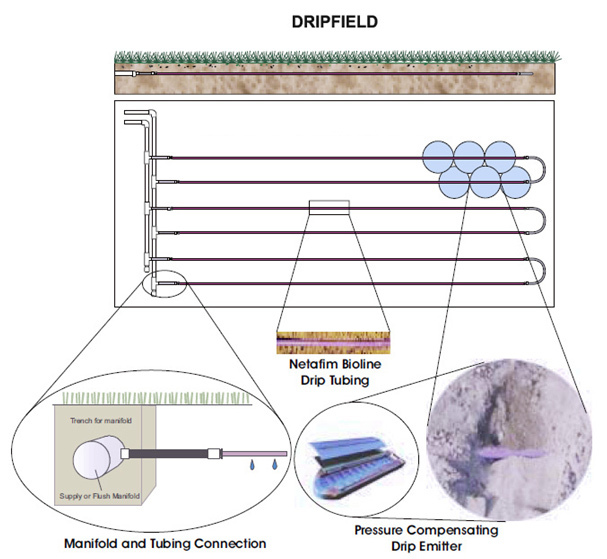 This system replaces the conventional drainfield product with a ½ inch diameter subsurface drip irrigation (drip dispersal) line similar to drip products used in landscaping. The treatment train consists of a trash tank, treatment unit (aeration chamber & clarifier) and dose tank. Some units are available in an “all-in-one” configuration in one tank. Effectively recycles all water consumed within a home or business. Wastewater is treated prior to dispersal. No real treatment occurs in the soil so no biomat develops. Effluent is slowly and uniformly distributed over a 24 hour period. Only a “wetting” of the soil occurs. Soil has time between doses to dry out. Drainfield reductions (up to 40%) can be applied. System occupies a smaller footprint especially when a mound is required. The dripfield can be installed in landscape areas. Plants are completely irrigated with your wastewater. Drainfield reduction allows larger homes to be built on smaller lots. Reduced setbacks to property lines, foundations and surface water. Dripline can be installed in areas where the conventional just won’t fit. Tremendous flexibility in the way the dripfield is installed (not bound to a “rectangular” footprint). Significant reduction in mound height/overall footprint; REDUCES COST! Excavations can be eliminated; REDUCES COST! Eliminate future repairs. Once installed, virtually a lifetime system. Pays for itself. In a mounded scenario, less expensive than a conventional system. THE BETTER SYSTEM ACTUALLY COSTS LESS! Can tabulate unobstructed area wherever dripline can be installed. The larger the system, the more cost effective it becomes. Dripline can be installed following contours of property (conventional must be installed level). Some products are perfectly suited for the residential market while others are capable of providing excellent treatment for higher flows- such as commercial sites. A specific treatment level may be required to overcome certain site restrictions or to meet code requirements. Our thorough knowledge of the various aerobic treatment-ATU-drip irrigation products allows us to provide designs that are site/project specific and budget friendly.